Looking to indulge during your break? 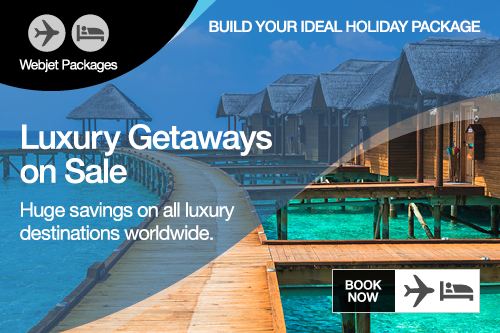 Unwind in style with one of Webjet’s great luxury holiday packages. Regardless of if you’re travelling solo, with a partner or with the whole family, Webjet offers plenty of great luxury holiday packages to match most budgets and travel plans. Everyone’s idea of luxury is a little different. From a few nights away from the kids in Sydney to a resort stay in the heart of the South Pacific or a 5 star hotel room in the heart of London, New York or Paris, there’s no shortage of ways in which to enjoy a taste of indulgence. Soak up your surroundings, get pampered at an in-house day spa or dress up for a fine dining experience. Whether you’re looking to active or simply sit back, relax and unwind, you’re sure to find a destination that ticks all the right boxes. Across the globe, you’ll find a wide selection of accommodation to suit most budgets and preferences. Splash out on an indulgent 5 star stay, spend a few nights in a luxurious resort or opt for something a little more modest and stretch your budget further. Secure your accommodation with Webjet and make the most of added extras such as free wireless internet, breakfast for two and free parking. Bundling your accommodation and flights together with one of Webjet’s luxury holiday packages is a great way to save. Simply choose your accommodation, select your travel dates and enjoy the savings.